Cocomo products from the House of Nature, are traditionally inspired, safe and toxin free. These natural & nourishing products have been formulated by a leading cosmetologist and our circle of moms for happy, healthy & confident kids. 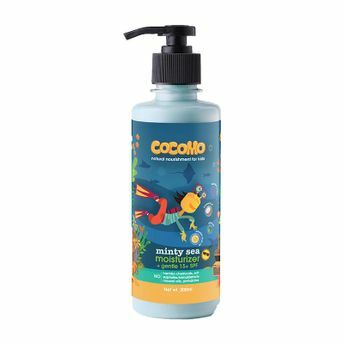 Cocomo Minty Sea Moisturiser with gentle sun protection SPF 15 is perfect for your child's sensitive skin. It helps soothe, moisturize and support the skin's natural moisture balance. Cocomo lotion also provides gentle sun protection along with glowing skin. It contains a rich blend of moisturising Coconut & Olive oil, nourishing Almond & Jojoba oil, hydrating Kokum & Shea Butter, anti-microbial Tea Tree oil, soothing Calendula, healing Aloe Vera, vitamin rich Passion Fruit which locks the moisture in and troublesome rays out. Explore the entire range of Creams, Lotions & Oils available on Nykaa. Shop more Cocomo products here.You can browse through the complete world of Cocomo Creams, Lotions & Oils .